Ancient traditions, from island Micronesia, Melanesia and Polynesia to the Americas, speak of a lost land shelf or continental mass, which formerly covered a considerable expanse of the Western and Central Pacific region, and of which only islands now remain [see Chapter One]. I have argued that this great landmass extended south to include New Zealand [then a single landmass], and that this landmass was joined to New Guinea-Australia and the great land-bridge extending to mainland Asia. To the Maoris of New Zealand it was the “Lost Land of Wainga-roa”. It had, they believed, extended from present-day Cape Reinga, and had been submerged by the sea, a disaster in which whole tribes of people had perished. Papua. These relics of old Uru survived the rising of the oceans which, in the closing stages of the last great Ice-Age, submerged the New Guinea-New Zealand land shelf, to create the legend of the “Lost race of the Solomon Sea”. These were, among others, the Ngati-Kaiperu, or “People of Eru” [or Uru]. Legends say they were a white-skinned race who built in stone, and whose ruined culture-centres now lie submerged beneath the waters of the Pacific Ocean. The Ngati-Kaiperu, both men and women, had the power of flight, and those who took to the air were given the name of ‘Tui’ or “Fly as a bird without flapping the wings”; in other words they were users of primitive hang-gliders. 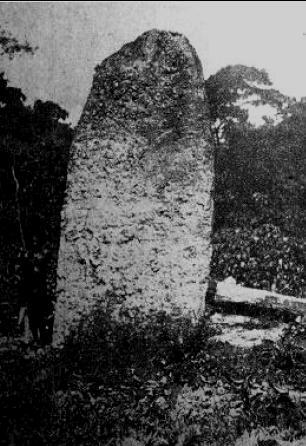 The Ngati-Kaiperu, or Uru were said by the Polynesians to have built large stone temples and other monuments, which were abandoned as the ocean rose over the land. Some of these monuments are said to survive above water today, on many of the Pacific Islands. Hotu Matua, the great blond-haired, fair-skinned culture-hero of Easter Island, is said to have arrived there in a great “feather boat” [ie a vessel with sails], from a sunken land to the west. 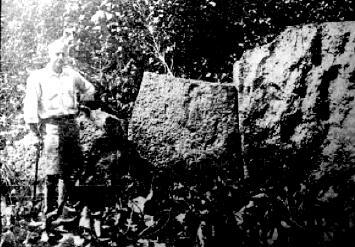 Hotu Matua subsequently introduced the art of stone building to the island. Obviously ‘Hotu Matua’ is symbolic of a whole people rather than an individual. In the “Codex Chimalpopoca”, one of the sacred books of the Toltecs, written between 200 BC-900AD, there is reference to a “rain of fire”, being symbolic of a great disaster, in this case, the “great flood”. The reference to men changed into goslings means that the survivors took to the ocean in watercraft to escape. The Australian Aborigines have the giant bullfrog - Tidalik the flood-maker - who caused a flood, and is an obvious race-memory of the flooding that occurred in Australia at the close of the last great Ice-Age. Similarly, the Iriquoise Indians of the eastern United States of America, possess the tradition that a giant bullfrog, the emblem of cold and water, had to be slain to release the waters of the earth which he had drank up, like Tidalik. The American Indians, from the tribes of California to the old megalithic cultures of Central America, all possess myths and legends of a great land, far across the Pacific, having been submerged in the ocean depths. Old Maori creation mythology is linked to this land, the traditions of which had been handed down to them from the earlier inhabitants of New Zealand, the fair-skinned Uru. The God Tane created this land and the stars overhead, including Te-ika-matua-a-taka-roa [the parent fish of Taka-roa] or “Great Magellan Cloud” and Nga-patari [the inviters] or “Lesser Magellan Cloud”. He then created Puaka [blazed up] or the Star Rigel, Taku-rua [rim of the pit], the star Sirius, both of whom would preside over planting and harvest time; Wero-i-te-ninihi [arouse the absconding], and Wero-i-te-kokoto [arouse the expanse], stars to preside over Summer. The first man was Tiki, whom Tane created after he formed the earth [Papa]. He then created the first woman, Ma-riko-riko [Glimmer]. The great landmass he named [Wainga - ‘gate’, roa - ‘long]’, the surviving remnants of the later great submergence; North and South Island, would be named Aotearoa by the early Maori colonists [a name roughly meaning “Land of the long white cloud”]. To the west Tane created another land, joined to Wainga-roa, Uru, a name meaning ‘God’, for this land would become known as a land of gods. To the east Tane created yet another land, that of Matuku, the “land where the sun rose”, and which could only have been South America. Here is ancient geographical information revealing the extent of early Polynesian trans-ocean exploration. A study of ancient mythology and legend reveals Wainga-roa was formed of hills, mountains and rivers flowing through deep valleys populated with animals and birds of all kinds, and ruled over by the fair-skinned race created by Tane, the Ngati-Kaiperu or “People of Eru” [or Uru]. This people were composed of large tribes, or communities which covered the landmass to its southernmost limits, that is what is now South Island-Stewart Island. The true dimensions of the sunken landmass of Wainga-roa may be deduced from geological evidence and the traditions of the Melanesian and Polynesian peoples. Extending north from New Zealand the land shelf on its western side roughly followed the Norfolk Island Ridge up to what is now New Caledonia and on to the south-eastern portion of New Guinea; and on its eastern side followed the Kermadec and Tongan Trenches, then eastwards perhaps as far as the Tuamotu Archipelago, its northern shoreline roughly including the Tokelau and Ellice Islands across to the Solomons. other huge stones forming these ruins. Photo courtesy Daily Telegraph, Sydney.